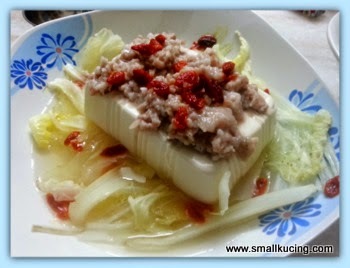 SMALL KUCING: Steamed Tofu with Minced Meat and Chinese Cabbage Recipe. 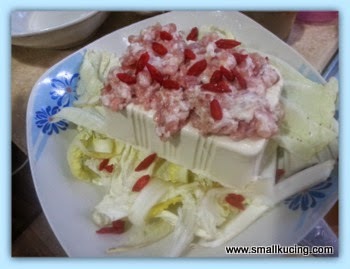 Steamed Tofu with Minced Meat and Chinese Cabbage Recipe. How was your weekend? 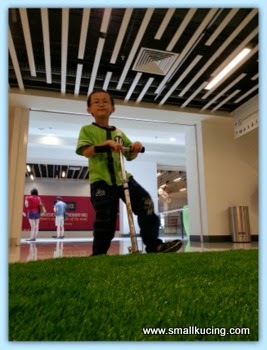 Did you go for the SCKLM? Or did you go to JayaOne for Indoor Cycling?Today is Monday. Sure many will have Monday Blues and feel lazy to cook . Here is one "lazy" recipe that is easy to cook and mess free. Mamarazzi got the idea of steam tofu from Sharon's Blog. Usually, Mamarazzi would just open up a packet of cold Tofu. Then sprinkle a bit of shallot and pour some soya sauce but the idea of steaming Tofu seems interesting. Add bit of salt and pepper on to the minced meat. Plus some goji and put into the wok and steam it till the meat is cooked. Jeng! Jeng!.....Steam Tofu with minced meat and Chinese Cabbage. Taste? quite good. Love the gravy coz it's sweet and salty. wow...mamarazi on cooking mood lately!! Did Small Kucing eat this dish? It looks very pretty! And guess what? It is Sunday afternoon here! Oh??? Never put Chinese cabbage beneath the tofu. Will try that next time. Thanks for sharing! Nice to put thin slices of salted fish with the minced meat - the variety we call "long" kiam hu here...and thinly sliced shitake mushrooms. I also steam tofu with minced meat and mushroom when I am lazy to think of what to cook. Good idea from mamarazzi to use cabbage! I like how you steamed it whole like that. I don't like to eat tofu but I sometimes will. This one looks delicious! that's good idea... got everything in a dish..eat your veggies :D! Looks good! I normally stirfry the meat while heating up tofu in the microwave. Then plonk meat on top. I like your idea though, everything in 1! Must try must try. wah, Small Kucing went to run in the SCKLM event yesterday?? or Small Kucing went to both the SCKLM and also Jaya One?? fuyoh, Mak Oi, really very energetic lah this Small Kucing.. when Small Kucing getting more energetic, sure Mamarazzi was getting more lethargic, muahahaha!!! hehehe, Mamarazzi's cooking time again!! actually tofu is one simple yet delicious dish.. but Uncle SK never thought Mamarazzi usually made it so so so much simple, just add soy sauce and then browned shallots??!! that's really lazy man cooking, hahaha!! wah, this recipe from Auntie Sharon leh but Mamarazzi changed a little bit.. bet she doesn't have mushrooms or too lazy to soak the mushrooms, so she used cabbage?? actually with cabbage also nice, because the cabbage will absorb the gravy and then become very nice, if the meat comes with mushroom will be even nicer hor?? Love cabbage and minced meat; and this dish is well-balance. This is a good simple dish - meat, vege, tofu and gravy all in one! Very inviting and next time I steam, I am gonna through in the cabbage as well. Your mamarzzi always shared recipes that looks easy like ABC. I will try this tonight!!!! memang lazy pun, but I like it, wakaka! I buy fresh tofu at a store in Pittsburgh. When they bring it out, it is still warm.